Ameriprise workers sue over fund expenses! 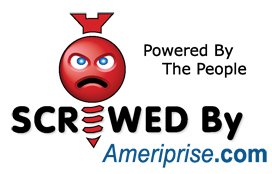 As I was looking for an image for this post I came across an entire consumer website devoted to the people who have been screwedbyameriprise.com. Let this be a lesson to you boys and girls…make sure you are asking your financial professional about their fees. Need help with the questions to ask? Feel free to give me a call. Next Article 401k Loan – Friend or Foe?